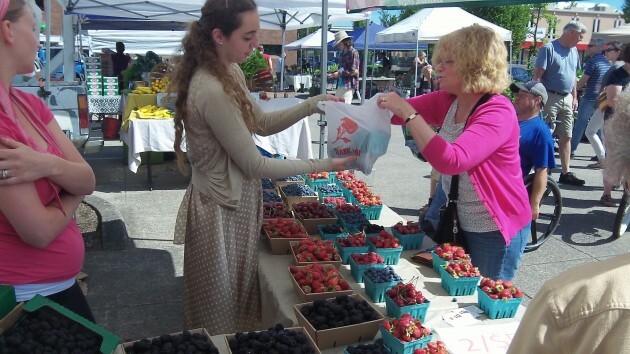 The Albany Farmers’ Market is open on Saturdays until mid-November. There’s all this talk these days about local food and sustainability and all the rest. But it takes a little effort to translate the talk into action. Effort and planning too. There’s a lot of stuff you can get at the supermarket you can’t find at those stands set up every Saturday in the City Hall parking lot and on Fourth Avenue. But at those farmers’ stands , you can get fruit that is actually ripe and ready to enjoy. You don’t have to store it on the kitchen counter until it feels less like a bunch of rocks — and then quickly turns into a rotten mess. And you can eat it without worrying that various chemical sprays have been used in the supply chain to keep it looking fresh. It’s fresh because it was picked that morning or the night before. At the farmers’ market, when you hand a vendor the price of a handful of potatoes, you’re likely to be handing it to someone in the family of whoever dug the tubers out of the dirt. And the people tempting you with lemon bars are the ones who baked them. You come face to face with producers and workers in family farms — people who face the many risks of agriculture and hope the fruit and vegetables and flowers they grow, and the things they bake or otherwise make, will find enough customers to make it worth the effort they put in.